Joey Brunk sizes up his defender. Brunk scored a career-high 17 points in the win over Miami. Photo by Jimmy Lafakis. 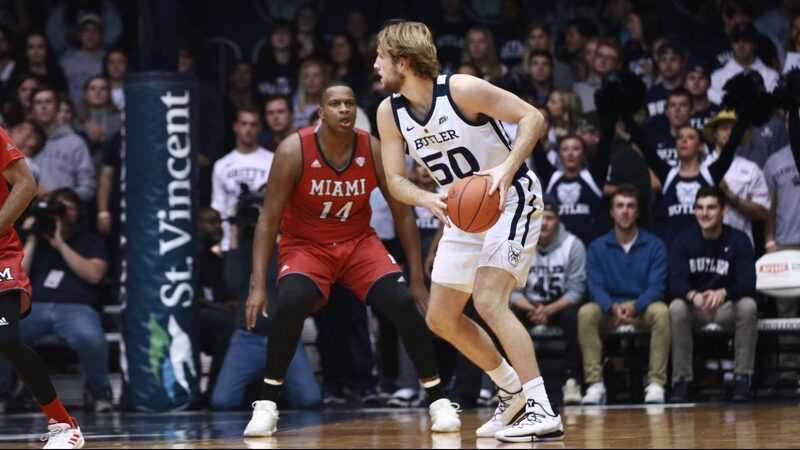 The Butler men’s basketball team kicked off its season with a 90-68 victory over Miami (OH) inside Hinkle Fieldhouse on Nov. 10. Butler controlled the game from start to finish and got contributions from a wide variety of players. Here are three takeaways from a convincing win. 1. Butler’s offense is miles ahead of where it was a year ago. Last season, it took the Bulldogs until conference play to get comfortable in their new offensive system. At times during the non-conference portion of the schedule, they looked out of sync and really struggled to score, most notably during the 61-48 loss to Texas. This team moves the ball much better, as their 18 assists would suggest. Kamar Baldwin recorded an efficient 21 points on nine-of-14 from the field and Butler shot 60 percent as a team. Aside from Baldwin, three other Bulldogs were in double figures. Butler was eight-for-21 from three, not outstanding but not terrible either. The 12 offensive rebounds and 48 points in the paint more than made up for the average shooting performance. Baldwin and Aaron Thompson combined for 10 assists, which made life easier for everyone around them. Without a pure scorer like Kelan Martin and no clear second option behind Baldwin, Butler has a chance to cause some significant problems for its opponents offensively. The ball rarely sticks with any one player and the points can come from just about anywhere. There is a fluidity and confidence on offense last year’s team never had, which is an incredibly promising sign. 2. The Bulldogs tightened up defensively after halftime. Of the RedHawks’ 33 points in the first half, 21 of them came from beyond the arc. Miami made 41 percent of its attempts. In 2017-18, Butler ranked 302nd in the NCAA in 3-point defense at 37.3 percent. Shooters were left open and weren’t always able to make the Bulldogs pay. Through 20 minutes, the same issues that plagued Butler last season, specifically the 3-point line, were very much still alive. For a team with so many questions on the interior, it was the perimeter that kept this a 12-point game heading into halftime. In the second half, the RedHawks were five-of-16 from three. It is way too early to draw any definitive conclusions about the Bulldogs’ defense, but the ability to make such a substantial improvement bodes well for the future. The fact that Butler is farther ahead on the offensive end is not at all surprising and makes sense considering how crucial Tyler Wideman was to everything the team did defensively. 3. Joey Brunk is a completely different player. Brunk’s 25 points in 41 minutes during Butler’s two exhibitions were a promising sign, but it’s one thing to put up numbers against Tiffin and Southern Indiana. Seventeen points and six rebounds against one of the better teams in the MAC are something else entirely. Brunk made all seven shots he took and had a new career high in points with 6:51 left in the first half. He also contributed a block and brought a contagious energy to the game. Both the stats and the eye test show this team has a different feel to it when Brunk is on the floor. Brunk finally looks comfortable and confident, something that could not be said at any point during his first two seasons. His potential was never in doubt, but whether he’d be able to reach it was. With Wideman’s graduation leaving a massive hole to fill, Brunk’s development could not have come at a better time. There will still be some growing pains as the season progresses. However, this is an unrecognizable version of Brunk. If he continues to play this well, LaVall Jordan will have no choice but to put him in the starting lineup.